Hinduism is a way of life rather than a religion. 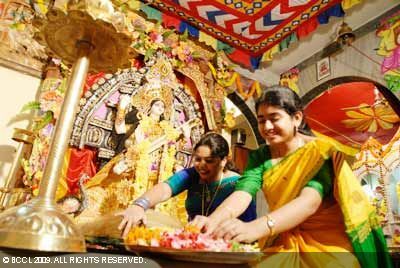 Saraswati Pooja is the festival that worships Saraswati, the goddess of learning. It also implies the start of the spring season (Vasant Ritu), and hence the day is also widely known as Vasant Panchami. This special day, which is believed to be Goddess Saraswati's birthday, falls on the fifth day of the bright fortnight in the lunar month, Magh (usually January or February) and Indian Hindus all over the world celebrate this festival in great fervor. The Hindu temples in India are filled with activities and Puja preparations on this day. Saraswati is the Goddess of all kinds of arts, sciences and learning. It is believed that when you pray to her, you will gain expertise in various art forms. The pooja is carried out to be blessed with intelligence and creativity. If you are planning to hold Sarasawathi Puja celebrations, there are plenty of things that you have to take care of. The planning has to start with sending out the invitations. It will be a hectic job to call everyone individually if you are holding a puja for a lot of people. The best idea would be to use Yoovite.Com for the invites. Online invitations are so much easier and the best party is that you can add a personal touch to them unlike the paper card invitations. We have a rich set of Indian temple designs for Saraswati Puja invitation cards. Choose you template, fill in details and send them all in a jiffy. Yellow color is given special importance on this day. On Vasant Panchami, Saraswati is dressed in yellow garments. Men and women try to wear yellow clothes on this day. Yellowish sweetmeats like laddoos and sohanpapdi are exchanged among friends, neighbors and relatives on this day. Saraswathi Puja celebrations will also have delicious vegetarian food for the guests. The most popular dishes for the day are Puris, different kinds of Sundal and Milk Kheer. 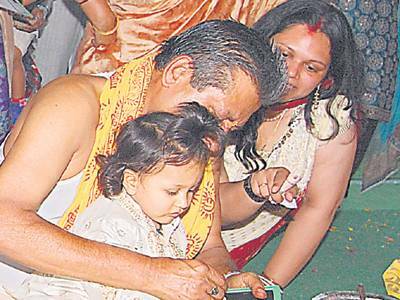 Some families follow a tradition of feeding Brahmans on this day. Make sure you organize a caterer for the home Puja food if you are inviting a lot of guests on the day. The best time to conduct Saraswathi puja at home is on Panchami Tithi. Some of the families also hold them on other days like Thursdays, Fridays and during Guru Hora. This festival is celebrated by Hindus all over the world with prayers and a new sense of optimism. It would be great to share the divinity of this day by inviting your near and dear ones, which is now made easy with the Saraswati pooja invitation online at Yoovite.Com.